I finally had some time to do some reading and I had a blast reading about this unique woman named Abigail. If you like books like Bridget Jones you should read this one. I won a copy of it a while ago on the blog hosted by the author and I'm sorry I didn't read it sooner. "Okay. This is it. I am going to kill myself ..."
After a suicide attempt goes hilariously awry Abigail Carter PhD candidate and owner of a gorgeous little kitten named Cedric finds herself stuck with her very own blog. 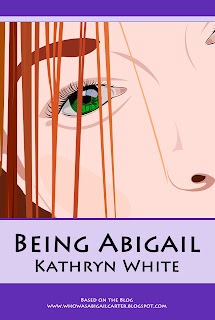 Before long, Abigail finds herself blogging all about her everyday life; phone calls from the future mother-in-law from hell, visiting a murderous aunt in prision, being stalked by her ex-boyfriend turned cop and the reappearance of Chastity MacKenzie, the girl responsible for her expulsion from boarding school many years before. Dark and occasionally laugh out loud funny, Being Abigail features a truly unforgettable heroine and a reminder that sometimes the best things in life happen when you're on your way somewhere else. Being Abigail is a hilarious story about a twenty something woman who after a small incident with his fiancé’s car decides to end her life. But somehow she decides not to do it and ends up writing a blog-journal about her life. This is a story about who we are and what the world expect from us, about love and friendship, about decisions and its consequences but mostly is a story about life and how it never is what we would expected it to be. Abigail is one of the funniest women out there, not only she is a drama queen, a bit childish and very impulsive she also has the craziest thoughts and ideas which leads to the most awkward situations and to various misunderstandings. Sometimes it feels like if she was refusing to grow up but once you get to know her you will learn that she is only a woman who wants to be loved, which is afraid of being hurt and has an idea of how a happy life should be. So in one sentence she is a very relatable character. Samuel, the fiancé, is a great character too, he is the opposite of Abigail. They’re two sides of a coin, complementing each other and making the other a better person. It was great to read about their relationship through the years. The other characters are well described, each one with a defined personality, great dialogues and a good addition to the story. Written as blog entries, which I absolutely loved, the book has an engaging style, a fast pacing rhythm, simple and easy language and a sense of reality. The references to popular series, shows, music, movies or celebrities made it even more awesome. It also has a solid plot or background, with references to past events the author builds a complete story. A story that seems real, it’s believable because it has happy and sad moments. And also includes really hard situations that made me love the story even more. Overall, this is a great story with high doses of humor, likeable characters, enjoyable setting and situations.